The new Spanglefish 2 admin control strip includes a tab called 'Manage Images'. This new facility lets you easily add and manage all of the graphic images on your site. You have full control of uploading new pictures, organising them in folders, and deleting images which you no longer use. 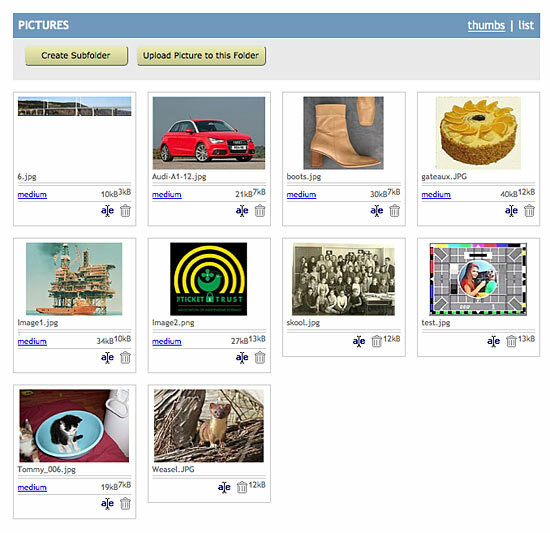 Once logged in, click on 'Manage Images' to view your site's Image Bank . . .
You'll see that the Image Bank page is split into two panes. The one on the left shows the folder structure, and the one on the right lists the images contained in those folders. Click on a folder in the left pane to see the images within it listed on the right . 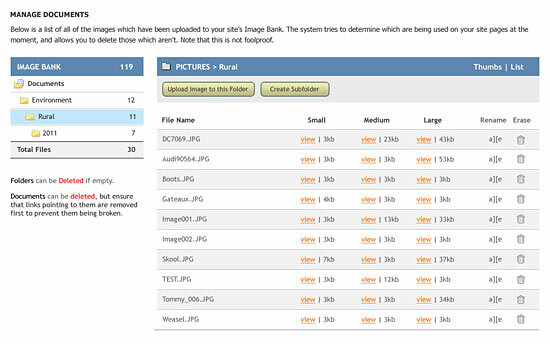 . .
By default the Image Bank is displayed in thumbnail format, but you can switch to list mode if you prefer. Both views provide infromation about the file name, the sizes of each image held in the bank (three sizes if your original was large when uploaded), a 'rename' option, and the trash icon so you can delete unused images. When you are using the Image Bank to select a picture to illustrate a page, it's often more convenenient to view the Image Bank in 'thumbnail' mode. You switch to list view by clicking on the 'Thumbs' link top right of the right pane - see illustration below. As well as giving you an overview of the images already held in your Image Bank, the Manage Images facility also lets you add new folders to group images, and upload new images. In the left pane, select the folder within which you want to create a new one by cliking on it. in the right pane, click on the 'Create Subfolder' button. Type in a suitable name for the folder and click 'confirm'. The folder will then appear in the left pane nested withkin your chose folder. In the left pane, select the folder within which you want to store the new image. 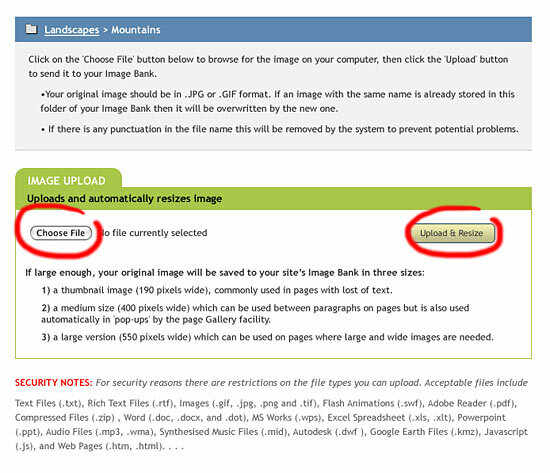 Click on the 'Choose File' button in the green panel to navigate to the image file on your computer. Click the 'Upload & Resize' button to complete the upload process. NOTE: Spanglefish FREE users are limited to storing 30 images in their Image Bank, and only the Small and Medium sizes are shown. Upgrade to Spanglefish GOLD to store as many as you like in all three sizes. Your original image should be in .JPG or .GIF format. If an image with the same name is already stored in this folder of your Image Bank then it will be overwritten by the new one. If there is any punctuation in the file name this will be removed by the system. (Some symbols such as ampersands are reserved by the operating system of the server, so must be removed to prevent potential problems). a thumbnail image (190 pixels wide), commonly used in pages with lots of text so that the text can 'warpa' around the image. a medium size (400 pixels wide) which can be used between paragraphs on pages but is also used automatically in 'pop-ups' by the page Gallery facility. a large version (550 pixels wide) which can be used on pages where large and wide images are preferred.